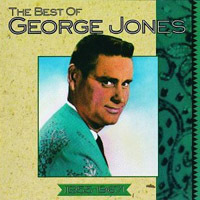 Under the heavy influences from Hank Williams, George Jones started his early career on Starday Records, a local Texas label. Although his first few releases was unsuccessful, he gradually gained popularity and he could have some hit singles until 1956. 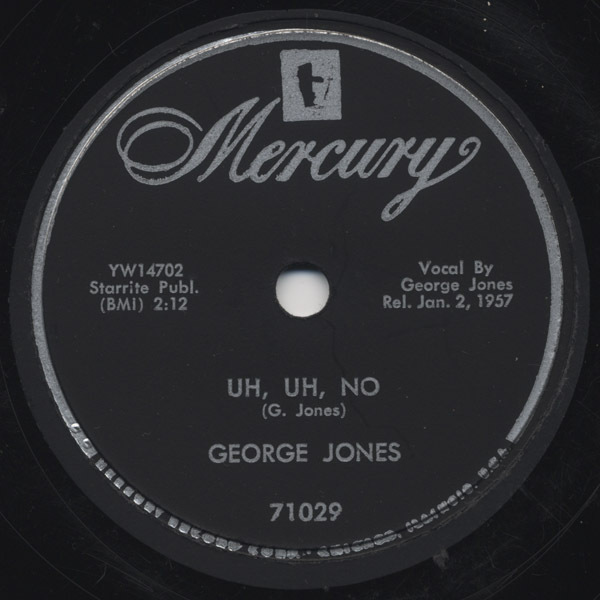 In 1957, Starday Records signed a distribution deal with Mercury Records, and since then, George Jones’ recordings were released from Mercury label. 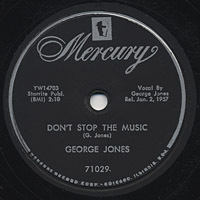 This 78rpm, “Don’t Stop The Music” backed with “Uh, Uh, No”, was the first release for George Jones from Mercury Label, became another top ten hit. You may notice on the label as “Rel. Jan. 2, 1957”. 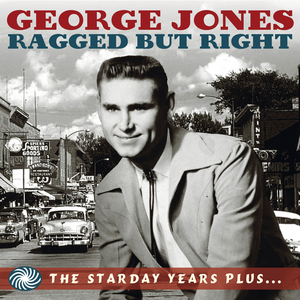 George Jones has been one of the most important icons in the Country field, but listen to this early work – a sound and a song full of intensity and energy, clarity and purity of sentimentalism – all of which his later recordings don’t have. The music style itself is a typical one of Country music, but the energy and the emotion this song has is so huge as Rockabilly does (this 78rpm has exceptionally high cutting level and deliver so powerful sound BTW). A really moving song, and what a powerful and energic sound this 78rpm can deliver! By the way, I bought this 78rpm unintentionally along with other 78rpms I wished to get. It was just because of this label design. It’s also surprising that 78rpm was still manufactured and released even in 1957, and I have never seen this label design type. Then I looked for more information on the web, and I found that there was yet another label design existed, a label with circular Mercury logo (which is very common on their LP releases). The below example is what I found at a certain auction site. 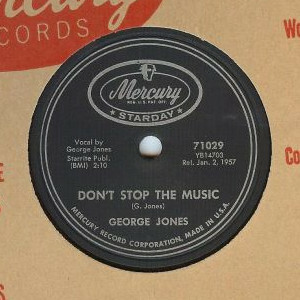 The same 78rpm, “Don’t Stop The Music” by George Jones, but with different label design. The circular logo has “Mercury / Starday”, which represents the distribution contract between Starday and Mercury labels. 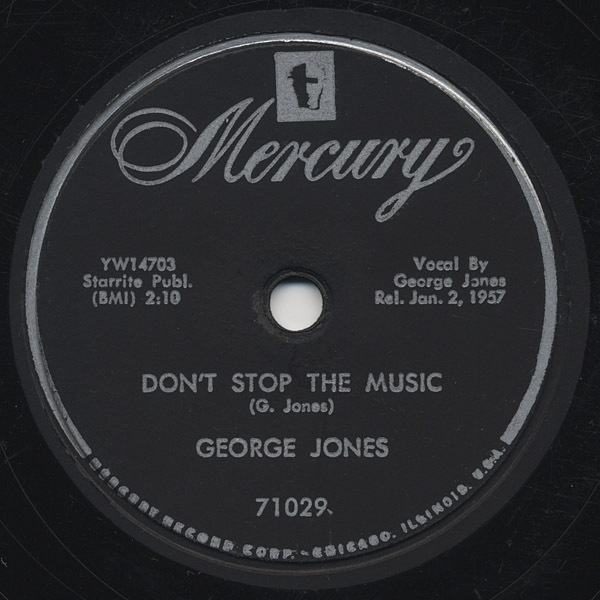 There is a well compiled best album of George Jones, from the fabulous Rhino label, including Starday / Mercury era (including this “Don’t Stop The Music”), as well as United Artists / Musicor era. This CD would be a good start for listening to George Jones and his music. 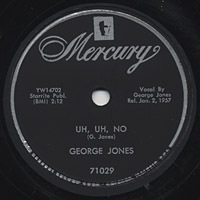 and tagged 1956, 78rpm, CD, Country, George Jones, Mercury, Rhino, Starday.